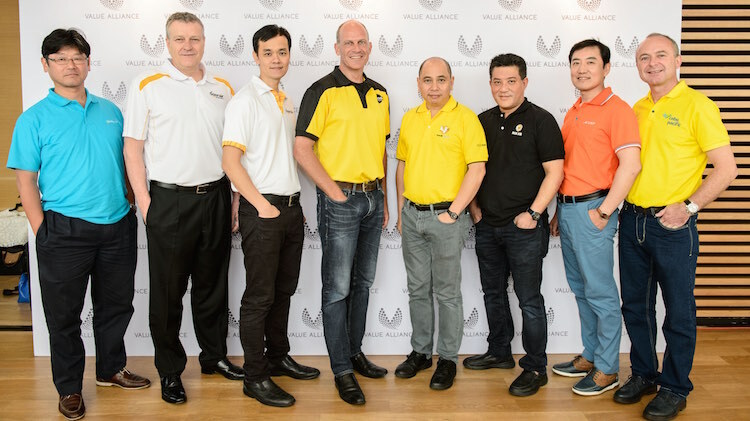 Value Alliance airline bosses Katsuya Goto president of Vanilla Air, Robert Sharp CEO of Tigerair Australia, Lee Lik Hsin CEO of Tigerair, Campbell Wilson CEO of Scoot, Piya Yodmani CEO of Nok Scoot, Patee Sarasin CEO of Nok Air, Ken Choi CEO of Jeju Air and Michael Szucs chief executive adviser of Cebu Pacific. Eight of Asia’s low cost carriers, including Virgin Australia-owned budget subsidiary Tigerair Australia, have broken new ground in the no-frills sector, forging an LCC alliance aimed at giving members a significant boost in network spread and lifting their ability to increase revenue. Announced in Singapore today on Monday and known as the Value Alliance, it is the world’s first pan-regional LCC alliance. Along with Tigerair Australia, members are Cebu Pacific from the Philippines plus Cebu Pacific subsidiary Cebgo, Korea’s Jeju Air, Thailand’s Nok Air and NokScoot, Singapore budget long-haul subsidiary Scoot, Tigerair Singapore and Japan’s Vanilla Air, owned by All Nippon Airways. Tigerair Australia chief executive Rob Sharp, in Singapore for the launch, said the alliance will provide greater value, connectivity and choice for travel throughout the Asia Pacific region as the partner airlines bring their extensive networks together. Last year, the member airlines collectively served more than 46 million travellers from 17 hubs across the region. Sharp said the new partnership is a win-win for every Value Alliance airline delivering significant benefits for Tigerair Australia customers. Sharp said Tigerair Australia is in the process of adapting the innovative technology developed by Air Black Box (ABB) to sell connecting fares throughout Asia Pacific on the new Value Alliance partner distribution network. 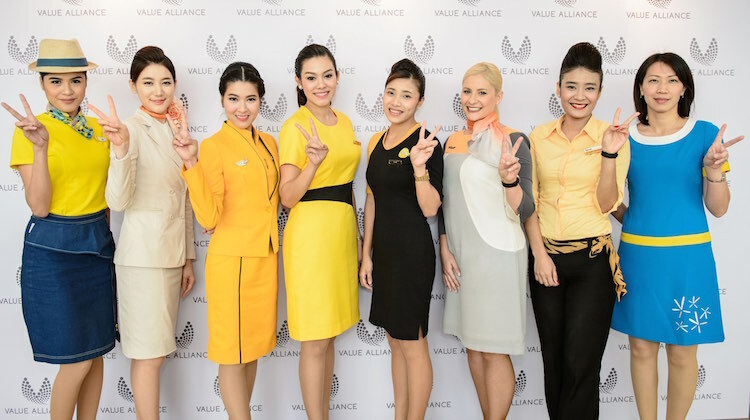 The Value Alliance airlines, who together cover a third of the earth and more than 160 destinations across the Asia Pacific region, will strengthen distribution in their non-home markets, expand their saleable networks via the provision of interline itineraries, retain their ancillary revenue opportunities and offer their customers a better, one-stop-shop experience. Membership to the Value Alliance is by invitation only. In 2015 its member airlines collectively served more than 47 million travellers from 17 hubs. Unlike legacy interline technologies, the ABB technology allows customers to enjoy the full suite of ancillary choices offered by LCCs – such as seat and meal selection, variable baggage allowances and other inflight features – across all partner airline sectors in a single itinerary. ABB’s ACE platform has been certified at the first stage leading to full NDC certification later this year. It is a major development in the no-frills world. Until now the only partnerships with the ability to co-ordinate to this extent have been groups of LCCs within the same ownership structure, such as Tigerair Singapore, Scoot and NokScoot, all owned or part owned by Singapore Airlines. For the first time travellers will be able to view, select and book the best-available airfares on flights from any of the airlines in a single transaction, directly from each partner website, thanks to technology developed by ABB. It is not known whether the alliance will eventually expand into other areas of efficiency gains such as joint maintenance or group purchasing. However, it is understood the original eight members are keen for other LCCs in the region to join up. Cabin crew at the launch of the new Value Alliance. From left to right: Cebu Pacific, Jeju Air, Nok Air, NokScoot, Scoot, Tigerair Australia, Tigerair and Vanilla Air. Very Impressive. Looking forward to see this world first technology platform. It’s the only thing which hinders these partner tie ups. You can’t even book a multi trip booking on Virgin Australia, and half their partner airlines you need to call up to book! Membership only. Oh, no Qantas Group Airlines need apply. Look they’ve just put all the low-cost cheapo bottom of the barrel airlines together, great! So suppose I booked a flight from MEL to SYD on Tigerair, and then made a separate booking on Cebu Pacific from SYD to MNL. But if my Tigerair flight was delayed and I missed the onward flight, then in the past I would be taking a risk of being out of pocket and having to make a new last minute booking on another flight from SYD to MNL. But now with this new alliance I will be able to do it on one booking and the airlines are taking on the risk of a missed connection and it will be up to them to get me there on another flight, is that correct? That all yellow uniform shown looks a bit yucky in comparison with the rest or maybe its just me a bit too bright ??? Let’s hope that Scoot will soon fly to Adelaide as our spirit ??? of Australia can’t seem to find Adelaide on the international map. Great to be able to book on a single site and know that is there is a delay by one airline that the others will alter flights so the journey can be completed without penalty. I think this is good, but I also think its a slightly weird thing, given that some people will benefit with saving a few dollars to maybe a few hundred dollars; BUT for the time money and extra hassle of swapping carriers and finding gates etc, one would think that you would just pay for a faster, one stop trip on a more comfortable widebody aircraft! To book any of the flights you just go to one of the airlines websites and you can book from there, they do not have a separate web page.